In order to illustrate how easy it is to hide sugar in seemingly healthy children's food, Panorama decided to enter the children's food market. We wanted to create our own lunchbox snack, and sell it to children and their parents. To help us through the maze of regulation, we enlisted the help of the Co-op. They have a reputation for campaigning on food labelling and quality. They agreed to help us, in order to show how some parts of the food industry make the most of the lack of regulation around food labelling. 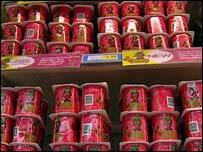 After looking at what was already on sale it was decided that a strawberry mousse, with four heaped teaspoons of sugar in every 125 g pot, would illustrate our point best. If a seven year old child were to eat two of these in a day they would already have reached the maximum daily amount of sugar recommended for their age group by nutritionists. It's important to stress that our product is not unusual: You could find a mousse like this on most supermarket shelves. 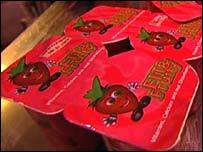 Food regulation allowed us to show strawberries on the packaging, despite there being two per cent fruit in the mousse. While we had to place the legal name 'strawberry mousse' on the packaging, we could hide it next to the ingredients on the side panelling. And because we had the legal name on the packaging, we could choose whatever name we wanted as our 'marketing name', which was the one the shoppers would see. 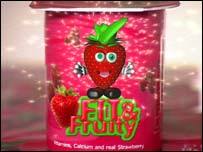 We chose Fit and Fruity - our product was nothing of the sort, but as long as our parents didn't know that we'd be fine. Central to the success of our mousse, was the marketing. We created a fun kids' character, based around a strawberry; then we filmed an advert which mentioned a free Frisbee with every purchase, but not much about the product itself. Now we had to put it to the test- could we exploit pester power, and convince the parents? A Co-op store in Derbyshire allowed us to put Fit and Fruity on its shelves, and conduct an experiment. A group of children and their mothers agreed to take part - unaware that Fit and Fruity was our own creation. We showed each child ten minutes of Saturday morning television - cartoons and adverts, and included our own Fit and Fruity ad. Then the mums were told to let the children lead them round the supermarket, picking the products they wanted. It's on the shelves...but will people buy it? Just to make sure the mums were sold on its healthy qualities, we placed our mousse in the fridge display next to the yoghurts. The good thing about our mousse is that it can be stored at room temperature but we decided putting it in the fridge, as some manufacturers do, would imply freshness and vitality. Almost half the children who took part went for Fit and Fruity, not bad considering we were up against recognised brand names. The parents, who had a quick examination before putting it in their basket, were happy with the choice - seeing a pot of yoghurt packed with vitamins and calcium. What we hadn't bargained for was how Fit and Fruity caught the eye of other shoppers, who kept putting it in their baskets and trying to take it to the checkout.